BEIJING: China appreciated Pakistan on Tuesday for its recent counter-terrorism measures. 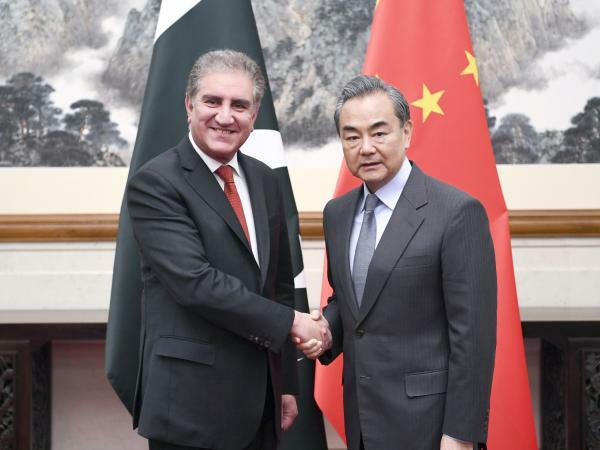 “China commends Pakistan’s recent strong counter-terrorism measures at home,” Foreign Minister Wang Yi said to reporters after meeting with Shah Mehmood Qureshi, his Pakistani counterpart. He added, “We fully support Pakistan in carrying through its counter-terrorism campaign”. Pakistani authorities have arrested hundreds of suspected Islamist militants and shut down more than 700 seminaries, mosques, and human welfare organizations connected to proscribed organizations. “We also call on the international community to adopt a fair perspective of the commitments and efforts made by Pakistan over the years to combat terrorism,” Wang said standing next to Shah Mehmood Qureshi. Wong said China believes that peace and stability in South Asia is in the common interests of all the nations in the region and also what the international community looks forward to. “China appreciates Pakistan’s constructive efforts to ease the situation and calls on Pakistan and India to continue to exercise restraint and resolve the differences that exist via dialogue and peaceful means.” Wang expressed China’s friendly sentiments for Pakistan by noting China calls Pakistan “our iron friends” because Islamabad “provides us with iron-like support” on core issues that concern Beijing and “Of course, China does the same,” Wang said. Foreign Minister Shah Mahmood Qureshi thanked China for “standing by Pakistan in these difficult times,” and appreciated China’s support. “I also briefed the foreign minister on the rapidly deteriorating situation on the Indian side of Kashmir, intensification of human rights violations, especially after Pulwama,” he said. “This is a concern because that leads to a reaction and that reaction at times creates tensions in the region which must be avoided,” Qureshi added. “I think there’s a need for a new assessment on how Kashmir should be handled by the Indians. There are now voices within India that are questioning the efficacy of the policy that they’ve followed for the last so many years,” Qureshi concluded. Foreign Minister Shah Mahmood Qureshi on his official visit to China also had a meeting with Chinese Vice President Wang Qishan in Beijing and conveyed greetings from Prime Minister Imran Khan. The Prime Minister of Pakistan is expected to visit China next month to attend the 2nd Belt and Road Forum, informed Qureshi. Reiterating the time-tested relationship between Pakistan and China, the vice president expressed how the relation between the two has strengthened since the visit of Imran Khan to China in November 2018. The vice president assured the Pakistani FM of the unwavering support that China will always extend to Pakistan for its territorial integrity and socioeconomic interests. Qureshi thanked the vice president for his support and appreciated the role China played in the recent tensions between Pakistan and India. They also exchanged views about the development in China Pakistan Economic Corridor(CPEC) and agreed CPEC would benefit the economic development of both countries. The foreign minister is visiting China for the initial round of Pakistan-China Strategic Dialogue.